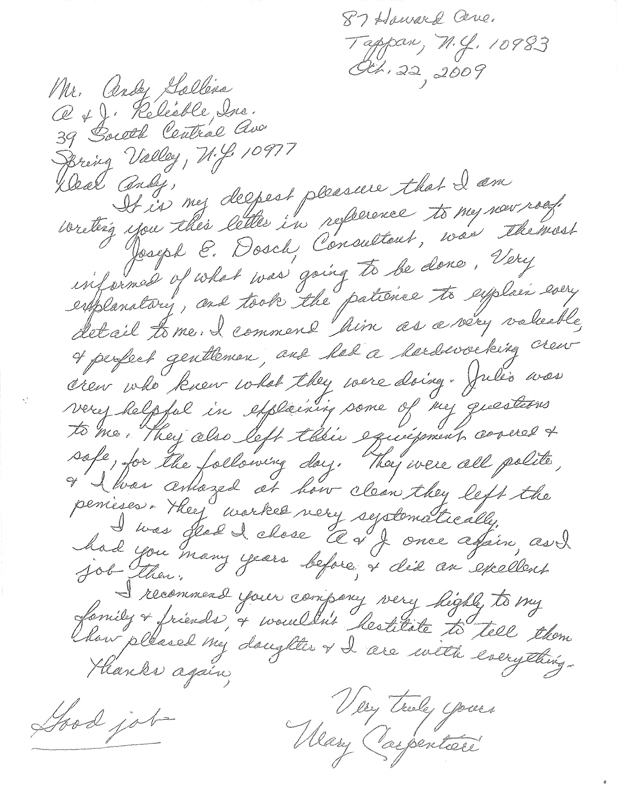 Residential Roofing Testimonials and Success Stories | Tri-State Area Contractors | A & J Reliable Inc.
Just wanted to say thank you for sending your gutter crew to fix the problem I was having with the downspout. 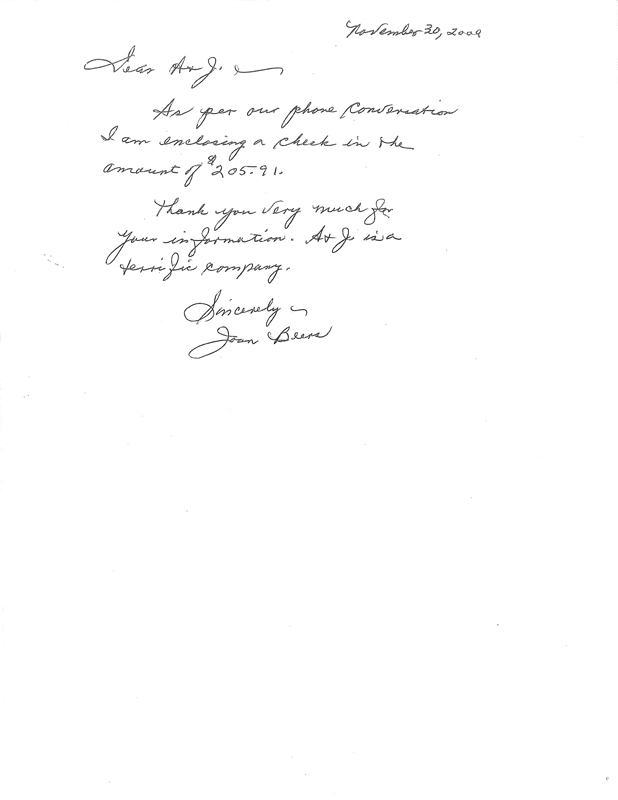 They were in and out fast and very professional in their solution to the problem and with great care of my property. 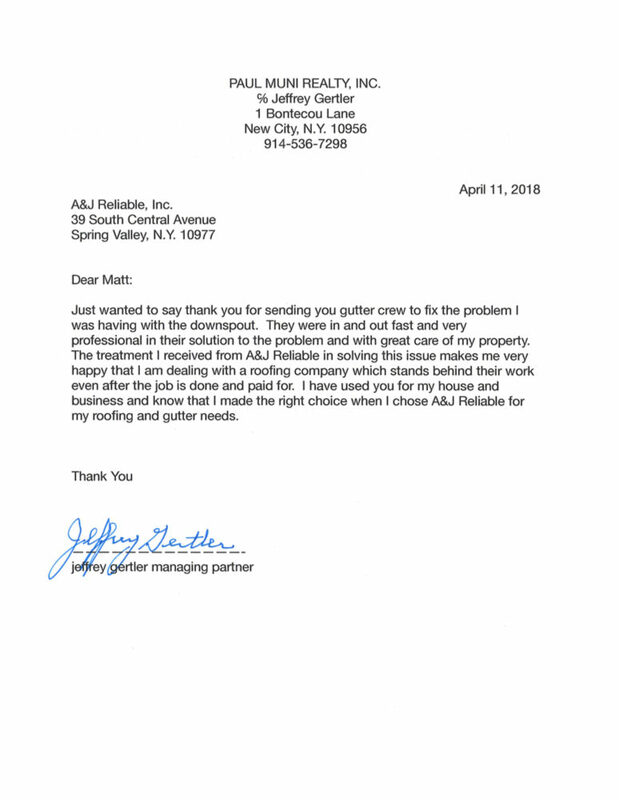 I have used you for my house and my business and I know that I made the right choice when I chose A&J Reliable for my roofing and gutter needs...read more? Managing Partner at Paul Muni Realty, Inc. 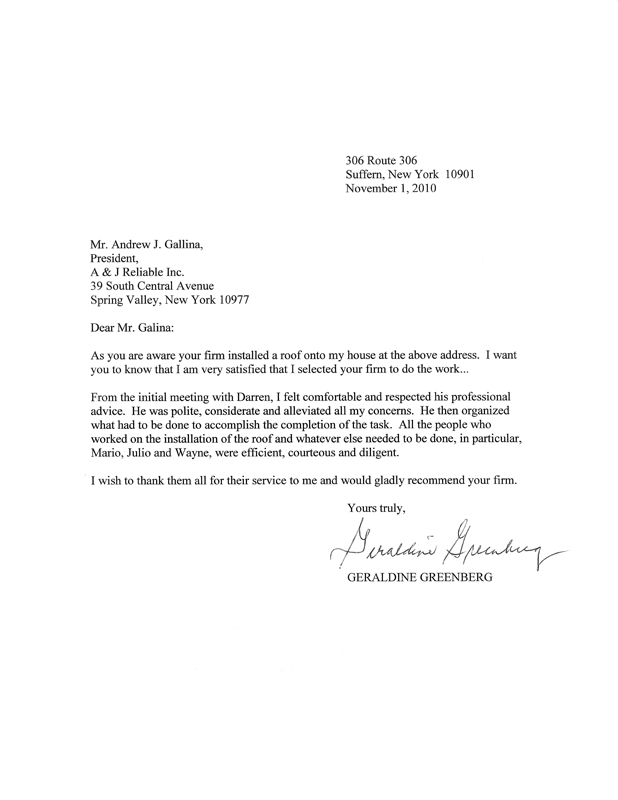 Thank you for an excellent ‘roofing experience.’ You promised that it would be fast, efficient, and clean, and it was all of that… read more? As you are aware, your firm installed a roof onto my house at the above address. 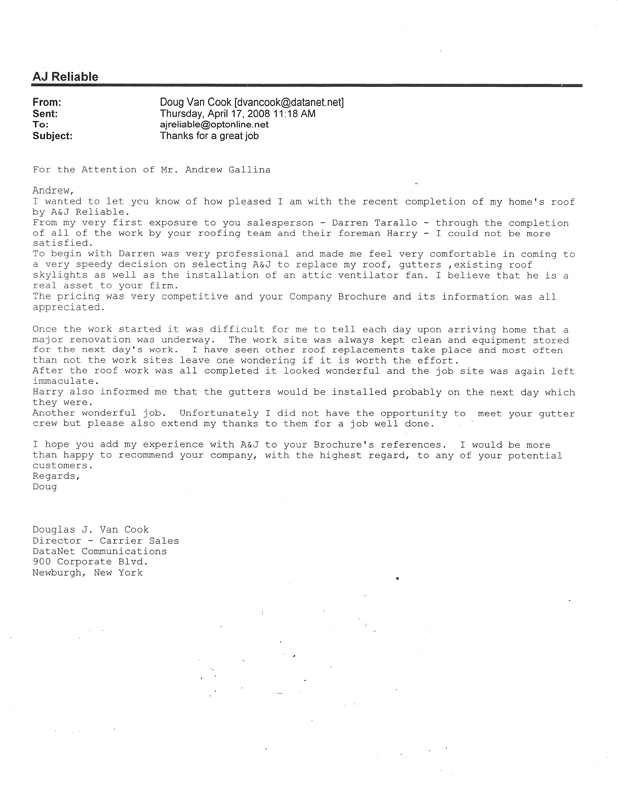 I want you to know that I am very satisfied that I selected your firm to do the work… read more? 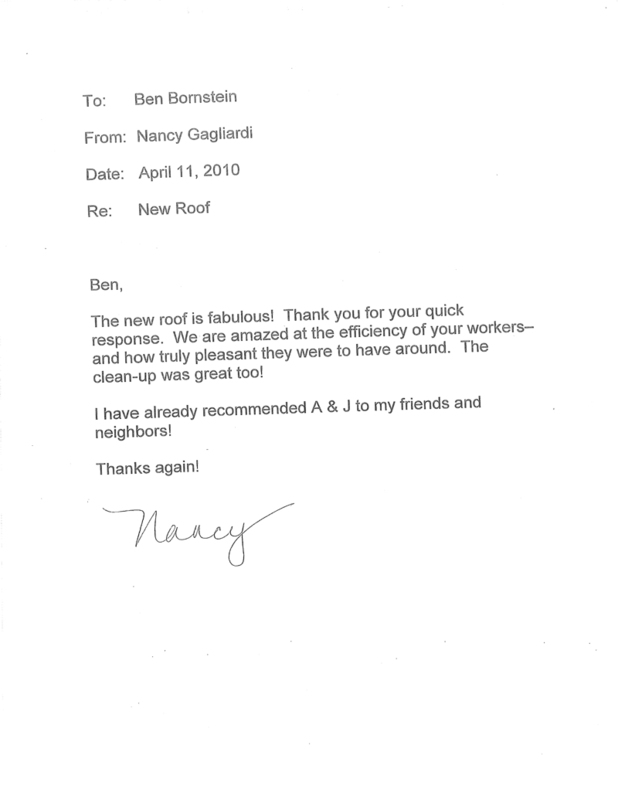 We are very pleased with the work and will definitely recommend A & J to others looking to replace their roof… read more? The new roof is fabulous! Thank you for your quick response. We are amazed at the efficiency of your workers… read more? Thank you very much for your information. 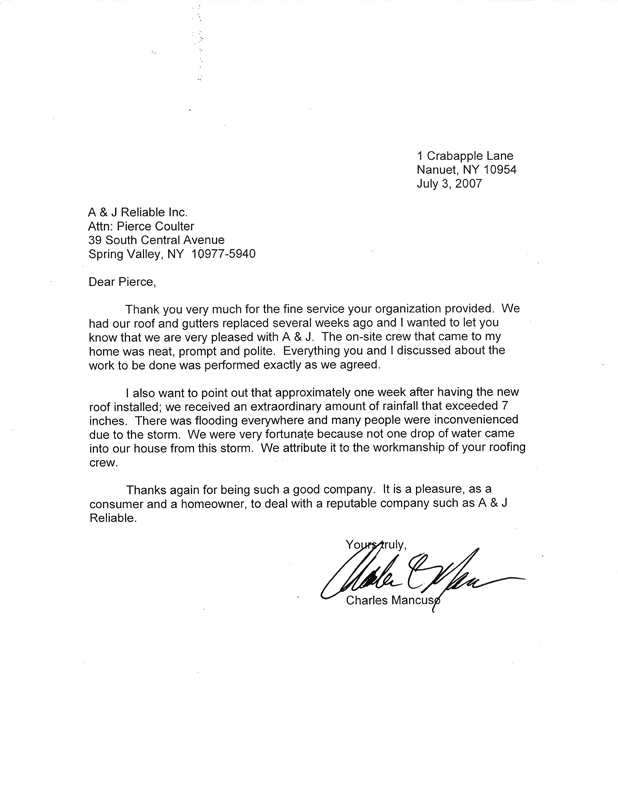 A & J is a terrific company… read more? We would like herewith to strongly commend the work of Freddy and David and Mauricio who worked extremely professional and attended ALL needs for today’s installation of Gutter Topper…We would like herewith to strongly commend the work of Freddy and David and Mauricio who worked extremely professional and attended ALL needs for today’s installation of Gutter Topper… read more? 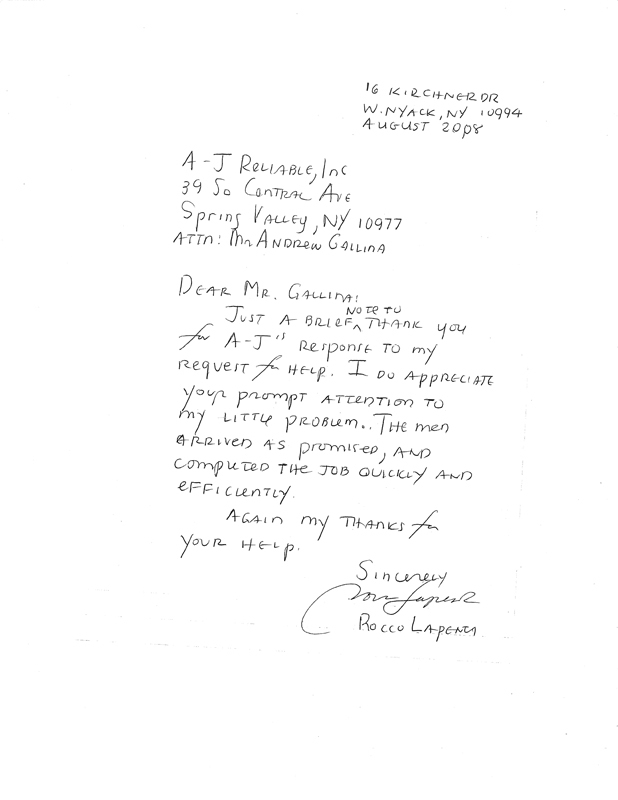 I was glad I chose A&J once again, and had you many years before, & did an excellent job them. read more? I applaud the workmanship of your team in installation of my roof and gutters. 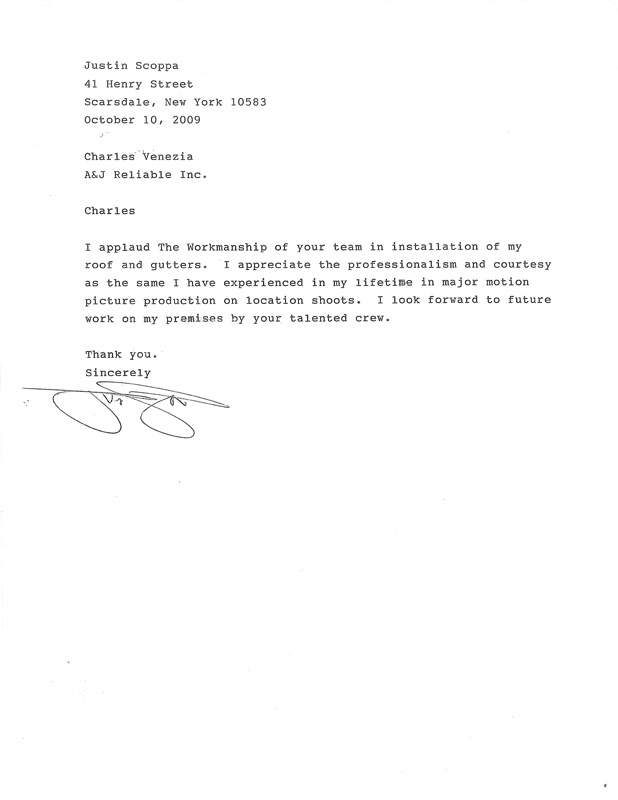 I appreciate the professionalism and courtesy as the same as I have experienced in my lifetime in major motion picture production on local shoots... read more? 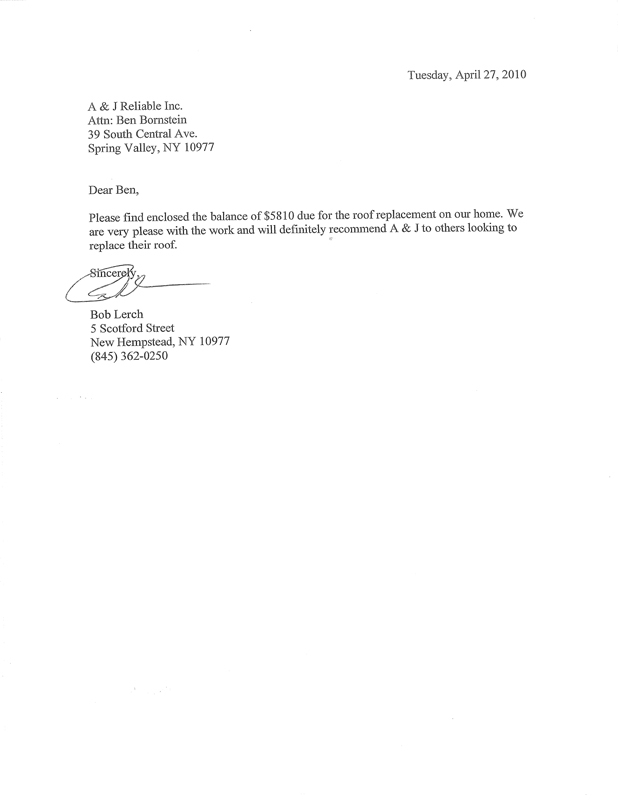 I would like to take this opportunity to thank you and A&J for the wonderful job and service that you have provided for the past 30 years… read more? I am writing to tell you how happy we are with our new roof. It looks beautiful and several of my neighbors have commented on it and asked who did the work… read more? Just a note to let you know what an asset Darren is to your company. 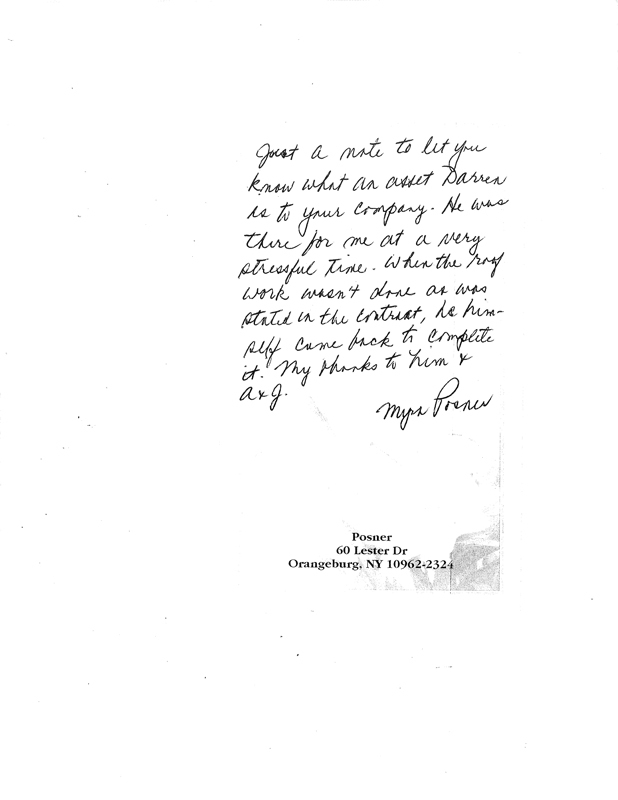 He was there for me at a very stressful time… read more? Our 43 year old house looks new again! Thanks to you and the wonderful people who work for A&J reliable, the new siding job has been successfully completed… read more? Just a brief note to thank you for A&J’s response to my request for help. I do appreciate your prompt attention to my little problem… read more? 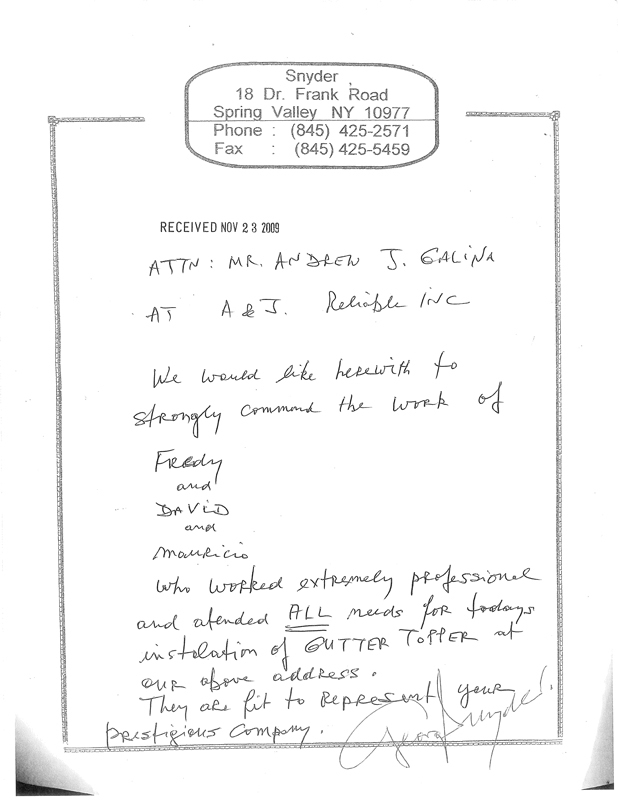 I wanted to let you know how pleased I am with the recent completion of my home’s roof by A&J Reliable. From the very first exposure to your salesperson – Darren Tarallo – through the completion of all the work by your roofing team and foreman Harry…read more? The roof looks wonderful and there are no problems with leaks or anything else concerning the job. I commend Mr. Pierce and his crew on a job professionally well done… read more? Thank you very much for the fine service your organization provided. 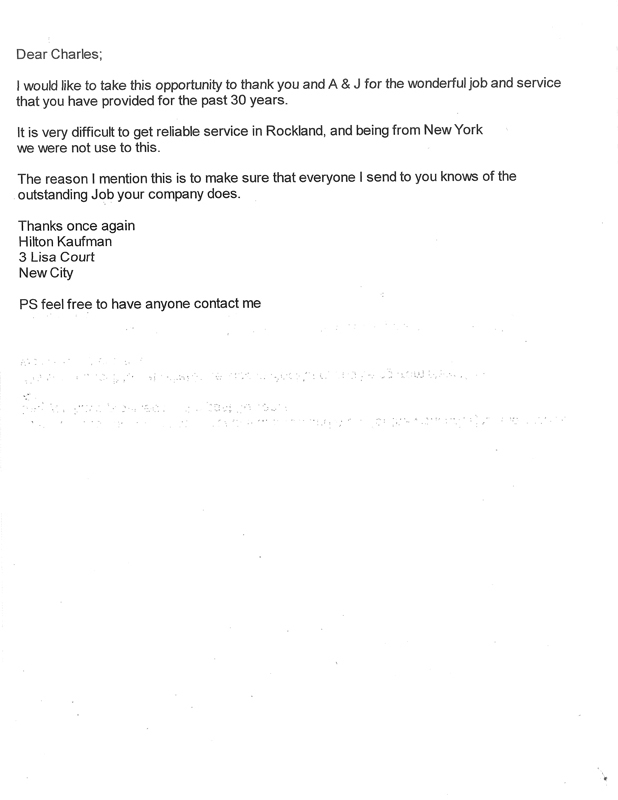 We had our roof and gutters replaced several weeks ago and I wanted to let you know that we are very pleased with A&J… read more? 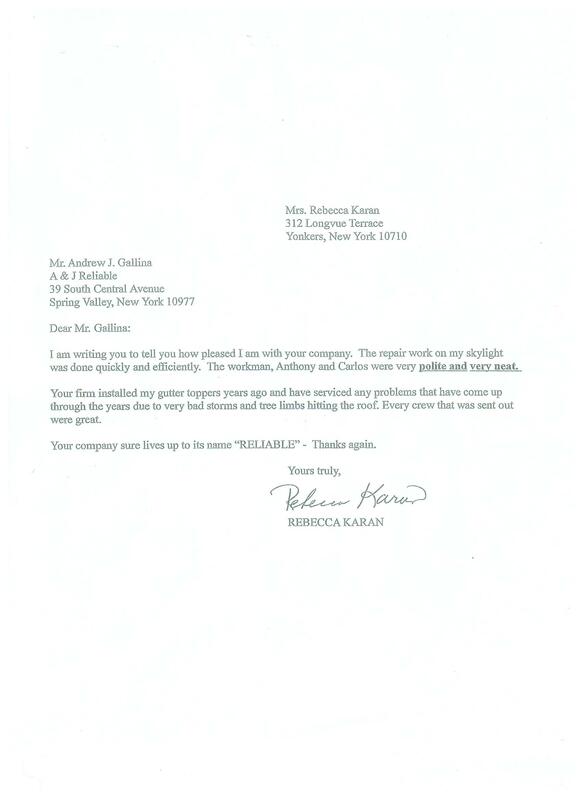 I am writing you to tell you how please I am with our company. The repair work on my skylight was done quickly and efficiently. 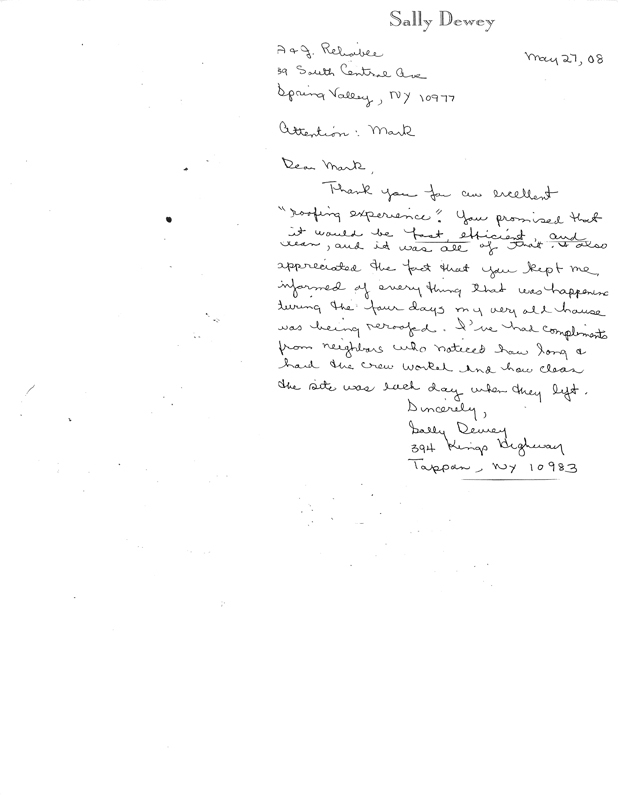 The workmen, Anthony and Carlos, were very polite and very neat… read more? 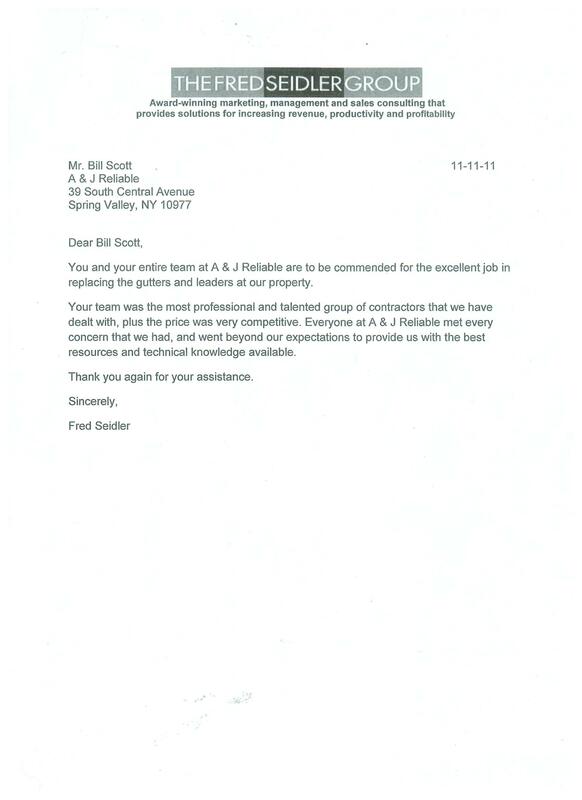 You and your entire team at A&J Reliable are to be commended for the excellent job in replacing the gutters and leaders at our property. Your team was the most professional and talented group of contractors that we have dealt with… read more? I would like you to know how satisfied I am with the recent job your men completed. My new roof and skylights look beautiful! 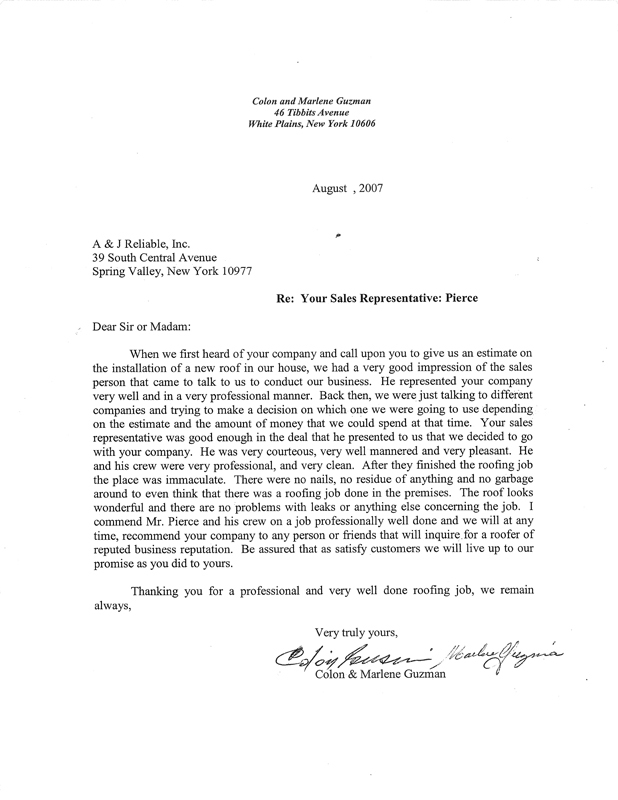 From the beginning your sales consultant was informative, helpful and considerate. I would be happy to recommend your company to anyone who inquires. On July 6, 2011 I had my skylight replaced and just wanted to let you know how happy I am. Your sales consultant made everything easy. He was so accommodating to my schedule and so nice. I will recommend you to anyone who needs roofing!